For my teen daughter and myself, NASCAR was a sport that was all about men in fire-protective suits and helmets who did nothing but drive brightly-painted cars and turned left a lot. Never really understanding the ins and outs of race car driving and what goes into it, it was a manly sport in both of our eyes that a few of our friends were into but that’s as far as it got for us. Our recent visit to Charlotte Motor Speedway in Cabarrus County, North Carolina for the Bank of America 500 Race in the Sprint Cup Series completely changed our minds on the fast-paced sport. Not only did we discover that there are successful women behind the cameras and the wheels of the race cars, but there’s so much more to it than just driving well. The visit definitely gave my daughter a new take on NASCAR and how women can succeed at any sport with a little bit of courage and tenacity. I have a new found fervor for the art of racing and I’m always on board with my teen learning and loving something new. Yes, the race itself may have gotten rained out and postponed for another day, but there’s so much more to do in and around the track that we had a great time with or without it! During any NASCAR race, the pit area is THE spot to visit before the engines are started. There’s so much to take in including watching the cars go through three separate inspections to make sure the body style is correct and the weight of each vehicle is 3,300 pounds. My daughter loved watching the inspections and was elated when she saw Jeff Gordon’s #24 car going through one of the queues. 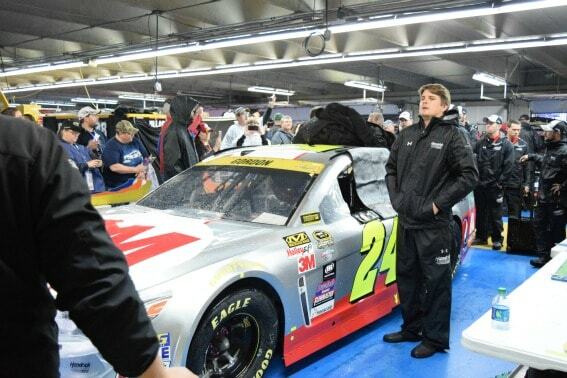 It was his last race at Charlotte and you could definitely tell his fans were loving the attention he was getting. We, however, headed over to Danica Patrick’s trailer. A very kind engineer on her team told us about the design process, how many cars per season they’ll build (at least twenty per driver! 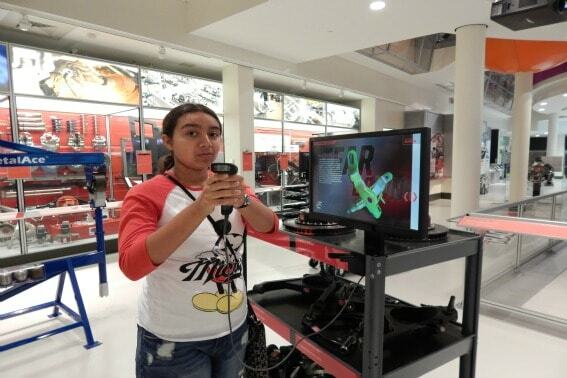 ), and how they are able to tweak her car’s body design as long as they keep it within the specs provided by NASCAR. Of course, I had to ask about the car’s colors and if she had any say in what goes on the outside, but it’s all up to the sponsors and what they like. 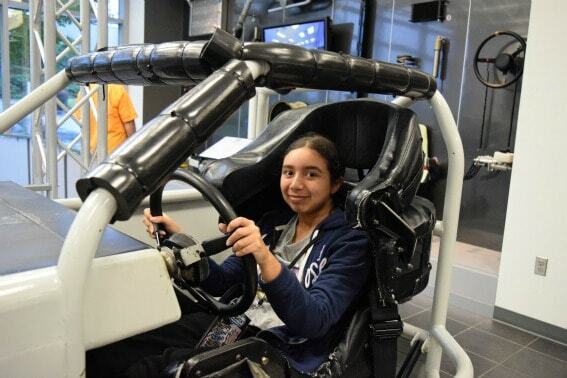 My daughter found the science behind each car’s creation fascinating and I loved that she was excited about it- I love anything that encourages a love of science and math. If you or any member of your family is a race fan, you’ve undoubtedly watched a show or listened to a broadcast from Performance Racing Network, or PRN for short. PRN is where all of the NASCAR feeds originate and it’s right in the pit area of Charlotte Motor Speedway. 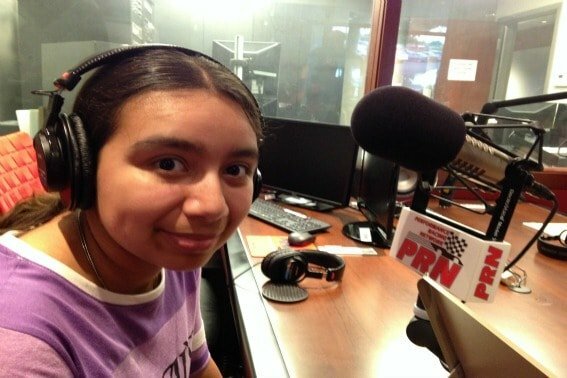 We were able to tour the building on a non-race day with our Over the Wall Tour and my daughter loved trying on the headphones used for broadcasts. On race day, however, I had the privilege of chatting with Wendy Venturini, co-anchor for the NASCAR Sprint Cup Series. We chatted about her life in NASCAR; her father was a driver and her mom worked right in the pit (the first woman to do so), and she talked about kids and NASCAR. After all, she’s a mother herself. 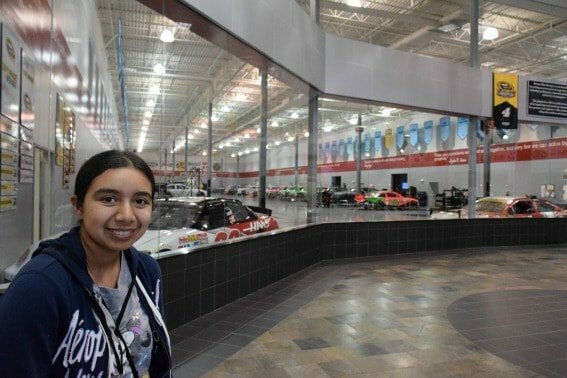 There are several behind-the-scenes tours at Charlotte Motor Speedway including an Over the Wall Tour where kids can take a ride on the race track and really go behind the scenes on Pit Road (my daughter loved this one!) and a Race Shop Tour where we were able to check out team cars being built and tweaked, trophies from races past, and even see Dale Earnhardt’s memorial statue in his home town. Did we see Danica’s #10 car during our tour? We saw two, actually. 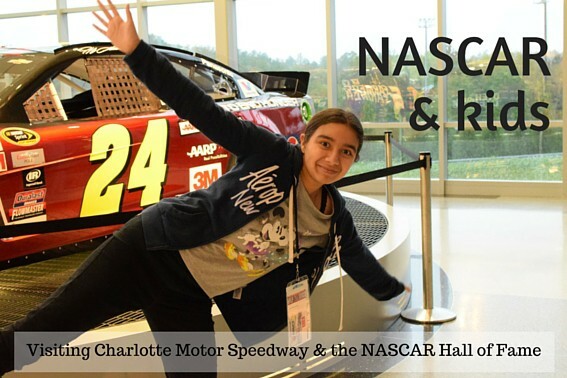 Just a short drive away in Charlotte proper is the NASCAR Hall of Fame– a great spot to learn all about the cars, their engines, and my daughter’s favorite, testing your skill on pit road. We battled each other for the best time and had a blast. The one thing I noticed about NASCAR events is this: it’s definitely a family sport. So many moms and dads had their kids with them and I loved the fact that there were multigenerational families taking in the events together. What I wasn’t prepared for was the volume: NASCAR cars are loud! I was quite taken aback by the engines’ sound and was very happy when I saw both children and their parents wearing auditory protection even during the pre-race events. Whether you’ve got ear plugs or state of the art headphones with a built-in radio, ear protection is a must. Many raceways allow coolers so check ahead of time to save some cash on bottled water and snacks. Disclosure: My family and I were graciously hosted by Cabarrus County CVB for the purpose of giving you fine folks the scoop on what makes NASCAR at Charlotte Motor Speedway so great for families. All opinions are my own! It’s good to know that the kids still love going in this kind of event. It seems that they really having the best time of their lives now. I want to come to this event also. Hopefully, there’s one in my country.